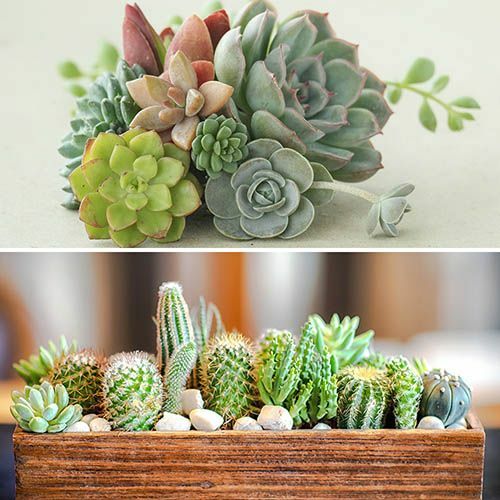 Succulents (of which cacti are the prickly variety) have evolved to survive in the most challenging of environments, so they're perfectly adapted to modern home living and are almost fuss-free! Needing very little in the way of care, these houseplants are ideal for anyone to grow, whether they're experts or complete novices, practically thriving on harsh treatment. Supplied as a collection of 12 mixed plants (6 cactus and 6 succulents) in 5.5cm pots, ready to go on a windowsill near you now! Currently the must-have plants for indoor gardeners, you can't escape the rise of the easy-care houseplant. With our collection of 12 starter plants, this is your opportunity to join in and grow these fun, easy plants - and don't forget to share your latest 'friends' on social media! Perfect as a gift for those new to gardening who want to grow something, or as a way to introduce children to the wonderful world of plants, this mixed collection of succulent plants and cacti is very forgiving and will tolerate more than the occasional bout of neglect and still look good! Succulents (of which cacti are the prickly variety) have evolved to survive in the most challenging of environments, which is why they are perfectly adapted to modern home living and are almost fuss-free! Needing very little in the way of care, these houseplants are ideal for anyone to grow, whether they're experts or complete novices, practically thriving on harsh treatment. Happy in a sandy compost, with plenty of light and a little water now and again, your succulent collection will thrive. If you're short on time but still want plants around you (after all, they do help clean the air in your home), then this is your solution! Slow-growing, they are the perfect for home decoration, especially when placed in a pretty pot on a bright windowsill. Our selection of succulent and cactus plants is ideal to get kids interested in gardening with their spiky shapes, just remember that they can be a bit sharp, so take care when handling them. Supplied as a collection of 12 mixed plants* (6 cactus and 6 succulents) in 5.5cm pots, ready to go on a windowsill near you now! *Plants may vary depending on availability. Use unglazed terracotta pots to display your cacti at their best. Not only decorative, they will lose moisture through the sides, helping to prevent to roots sitting in damp. Always use specialist cactus compost when potting. This is sandier and grittier than ordinary compost which helps keep the plants dry. Keep plants frost free - although some will tolerate low temperature, in general they need to be kept above 8-10C, so make ideal houseplants. While cacti survive on little water, they will not thrive. From April to September, water weekly, allowing the compost to soak up water and drain freely. Feed with a general-purpose feed at 1/4 strength once a fortnight. From October to March, water only when the compost has dried and then only enough to stop plants shrivelling. Keep your plants in bright, but not direct sunlight an east or west facing windowsill is ideal. Dust can build up over time, so keep a soft paintbrush handy to remove it as necessary. Remember that cacti are prickly beggars - always wear protective clothing when handling.